Zenith International College has been determined to give the students a good practice regarding the business and management studies. The students are more focused for the bright career at the field of banking and finance. The students will be offered with various programs regarding the course of commerce. The college tends to provide the students the best of the education regarding bachelor and masters degree. Students will be educated and trained in such way that they will be able to face any type of problem related to the field of Business studies, economics, and stock marketing many other risk factors related to the commerce. 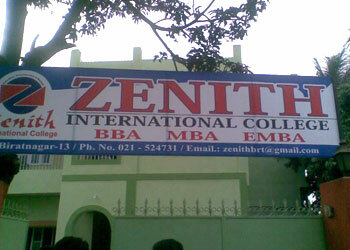 Why Zenith International College ? The faculty members of Zenith are extremely promising and brilliant. The faculty has been divided into three different courses including BBA program, MBA program and Executive MBA. The faculty members are trained and experienced so they have a unique way of teaching the students through which the students would grow confident among themselves and would be tactical bankers with proper managerial skills. The students would gain the bachelor education from the college and would also get the professional level of knowledge from here itself. So Zenith shares a familiar environment with its students. Zenith International College offers a Bachelor of Business Administration that has been designed to develop a wide range of business knowledge and skills regarding the course. For further details to know more on description about this college and course browse the link. Are you planning to specialise in the field of Master of Business Administration then you can be a part of Zenith International college and gain a broad range of knowledge regarding business and its principles? Browse for more information. Executives Master of Business Administration program aims at serving qualified education regarding business, management, accounting and financing and helps in the sector of business. Read more on details about this course at Zenith International College.